A TVA plant manager oversees the operating plant, which continues to produce coal ash. Utilities used to wash the coal ash out of plants and store it in ponds. A yellow well sits in the middle of an ash stack at a TVA plant in Stewart County. It digs deep into the ground to test for ground water contamination. Exactly 10 years ago, one of the worst environmental disasters in U.S. history happened near Kingston, Tennessee. Over a billion tons of coal ash spilled from a pit at a Tennessee Valley Authority plant into the Emory and Clinch rivers and surrounding land on Dec. 22, 2008. Since then, the state and federal government have cracked down on TVA's handling of coal ash pits, but the utility is still being questioned on whether it’s doing enough to prevent long-term environmental damage for communities that surround them. In Humphreys County, Gary Bullwinkel often visits the campground he used to play at as a child. He'll walk onto a creaky dock covered in red and green leaves and look beyond the Kentucky Reservoir. "If there were an accident, it would be damaging the local people's use of the river and exposing them to dangers of coal ash they're not informed about." "Anytime we ever swam, that was just part of our vista, the ash and the pollution," he says. That vista he’s referring to is a line of gray industrial buildings whining loudly in the distance. One among these isn't making noise, but it stands out. "A lot of coal comes through here, where you see that tall smoke stack," he said. "That’s the Johnsonville Plant." Johnsonville is no longer operating. But for nearly 70 years, it burned coal and produced a toxic byproduct: coal ash. Up to 5 million cubic yards of it is now stored within a pit right in the middle of the Kentucky Reservoir, according to TVA. It’s classified as unlined, meaning there may be no protective layer between itself and the water. TVA's Johnsonville Plant sits on the Kentucky Reservoir. It's coal ash pit is visible. Many residents are unaware of this, but others, like Bullwinkel, worry. Chemicals in coal ash, including elements like arsenic and lead, have been linked to health effects such as cancer and kidney failure, according to the Environmental Protection Agency. 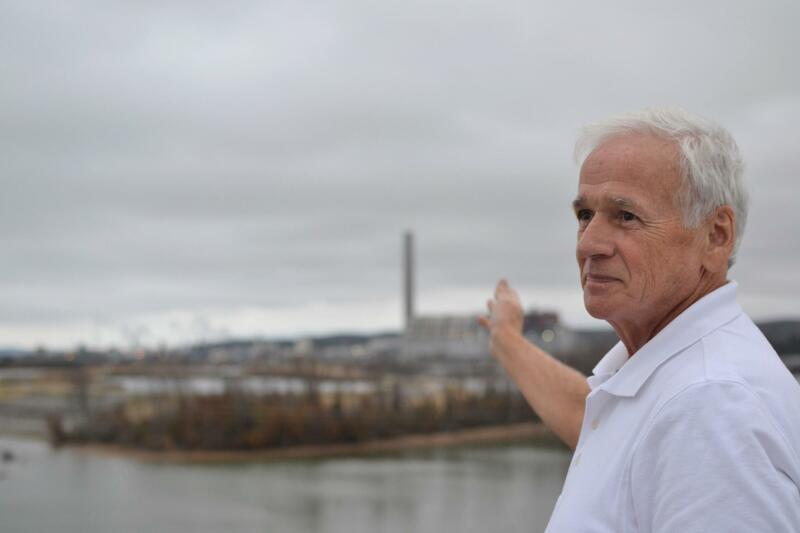 Resident Gary Bullwinkel points to his vista — the Johnsonville plant in Humphreys County. "If there were an accident, it would be damaging the local people's use of the river and exposing them to dangers of coal ash they're not informed about," says Bullwinkel. The Johnsonville pit is one of a couple dozen across the state and over 1,000 in the nation, many of which are also unlined. Their potential dangers came to the forefront after the 2008 Kingston spill, when coal ash burst from a TVA pit and smothered 300 acres of a nearby town with toxic muck. It was a wake-up call for the state and the nation. Chuck Head, assistant commissioner at the Tennessee Department of Environment and Conversation, says after Kingston, the state responded immediately. "We asked TVA to look into the structural stability of all their ponds and landfills," Head said. "The legislature issued a resolution that required TVA to tell the department and legislature how it's going to move away from wet ash to dry ash. That means the coal ash would look more like a landfill, rather than a fluid pond, to be more stable and prevent future spills. A 115-acre coal ash stack rises several feet into the air at an operational TVA coal ash in Stewart County, Tenn. But in 2015, environmental groups sued TVA at its plant in Gallatin, saying that the pit was still leaking coal ash into the Cumberland River. In response, the state issued an order, requiring TVA formally investigate potential groundwater contamination at every one of its sites. "Each of the different eight sites have an investigation plan that’s been approved," Head says. "Once we get those in, we’ll figure out what’s the best corrective option." Around that same time, the federal Environmental Protection Agency also rolled out national coal ash regulations on unlined pits, requiring utilities to report water contamination data and start the process of either covering these pits up or removing them entirely. But in Tennessee, TVA says it hasn’t finished those investigations required by the state. And it hasn’t released its final water monitoring data under the federal rule, either. So the ultimate fate Tennessee's pits are still largely to be determined. Scott Brooks, TVA spokesperson, says since the Kingston incident, the utility has committed to converting its wet ash to dry ash throughout its network. He also says it’s building lined landfills to safely store any new ash produced at operating plants, like Cumberland Fossil Plant in Stewart County. Some examples of this work, Brooks says, include pits at the John Sevier plant, which have been dewatered and capped. At the Gallatin site inactive ponds have been dewatered, and old sites at Watts Bar have been capped off too. 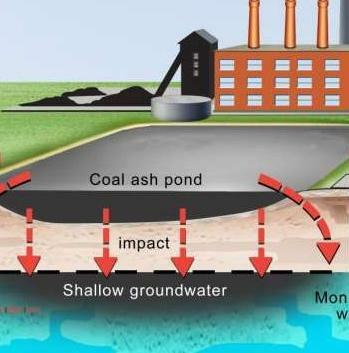 Coal ash contaminants in unlined pits can seep into groundwater, which goes back into rivers and streams. "We’re installing even more monitoring wells, testing wells, so that we’ll have not only the historical data but new data coming out in the next year and half," said Brooks. But Amanda Garcia, senior attorney at the Southern Environmental Law Center, believes new data is probably going to reveal science that is already known — leaving the ash in an unlined pit, even if it’s covered up, is going to contaminate water, she says. "Years of groundwater monitoring data show that there are problems at many of these sites," she says. At TVA's Allen plant in Memphis, for example, arsenic was found at 300 times the groundwater protection standard. TVA responded that the high levels likely came from a different source, not the coal ash pit. Garcia accuses TVA of slow-walking the clean-up process. The utility — like most others across the nation — has typically said it prefers covering up pits and keeping them in place, saying it can be done in a way that’s just as protective as moving the ash somewhere else. And moving can cost billions of dollars, as Duke Energy in North Carolina told regulators. But other major utilities have already started to reveal their water contamination data, and it paints a dire picture of coal ash contamination across the nation. Pits in 22 states are leaking excessively high levels of toxic chemicals into water, according to documents acquired by Earth Justice. In South Carolina, several utilities have already decided to remove around 20 million tons of ash. Residents in Stewart County often fish just beside the Cumberland Fossil Plant. Garcia says it's ironic that TVA is lagging behind other utilities, because its spill is what started the coal ash clean-up movement. "Here we are 10 years later, and they still have leaking unlined coal ash ponds. The state can step in, and should step in, and identify places where it’s just too dangerous to the people of Tennessee to store coal ash the way TVA has been storing it." TVA says it’s not delaying, but simply waiting on more data and science to make an informed decisions. As a public entity, it says it has an obligation to its customers to make the best financial decision. But the longer TVA waits to handle the ash properly, its critics say, the more it will cost generations to come. It's been a decade since the Kingston Coal Ash Spill became the worst disaster of its kind in U.S. history. More than 1 billion gallons of the byproduct — made by burning coal to produce electricity — poured out over hundreds of acres in Roane County. Now the workers tasked with cleaning up the massive mess are suing the company that hired them. Hundreds have been sickened and dozens have died. The coal-fired power plant in Gallatin is the central figure in a federal trial in Nashville this week. Environmental groups sued the Tennessee Valley Authority over contamination related to runoff from coal ash being stored in a giant pile on site. The Tennessee Valley Authority may have no choice but to move a mountain of coal ash by its power plant in Gallatin. A federal judge ruled against the utility Friday, ordering TVA to excavate the decades of waste and move it to a more appropriate site.